During a break today during our MDTTC camp yesterday, several of the kids began arm wrestling. Alarms began blaring in my head. Long ago I was a competitive arm wrestler. How competitive? Here's a picture in the newspaper of me winning the 1983 University of Maryland arm wrestling championships. (Little known fact: arm wrestling is more technique than strength, though of course at the higher levels you absolutely need both. In a few minutes I can teach an average person how to beat a much stronger person.) What's not mentioned in the picture caption was that during this match I hurt my arm so badly that I was out of table tennis for six months. And it was far worse than that - I've had ongoing arm problems ever since. It not only knocked me out of table tennis for months at a time, it ruined my game on and off for years. When I hurt the arm I was a 2200 player. Here's chapter 11 of volume 14 of Tim Boggan's History of U.S. Table Tennis, which just went online. In it you'll find me losing in the final of Under 2000 to Stephen Yeh at the 1985 U.S. Open. Under 2000??? Me??? But that's what happens when your arm is constantly hurting, and you can barely loop or hit backhands. I probably took off 1-2 months to rest it at least 7-8 times, and it rarely helped. (I finally mostly got over it with a combination of ultrasound treatments, strength exercises involving stretching a thick rubber band in various ways, and lots of irritating rest. I'm not the only one this has happened to. I'm hitting a blank, but I remember others who have injured their arm from arm wrestling and had to take time off from table tennis. It's just so easy to spend a few seconds with an impromptu and informal arm wrestling match, without realizing the possible consequences. Here's a page showing common injuries from arm wrestling. The list is rather long. So when I saw the kids arm wrestling, after a moment of reminiscing and reliving painful memories, I warned them against it. I also pulled aside some of our top juniors and sort of gave them the riot act - basically, do not risk all your years of training for this. No arm wrestling! I wonder what other activities up-and-coming table tennis players should avoid. Skiing? (Several of our kids ski regularly, and as far as I know there's been no broken legs or other injuries.) Sky diving? Bungee jumping? Bear wrestling? Some coaches advise against tennis since it can mess with your table tennis strokes, and that's probably true for developing players, but I don't think it seriously affects a table tennis player whose strokes are ingrained. If you want to see hyper-muscled arm wrestlers showing off their strength and then playing table tennis, here's the page. Yesterday was the first day of our MDTTC summer camps. They are Mon-Fri every week for ten straight weeks. They are for all ages and levels, but are dominated by our junior players. (This week's camp has only one player over age 18, and he's 22 or so.) Turnout was a little smaller than usual, with fewer out of towners than usual. Coach Cheng Yinghua said he thinks this is because there are so many other training centers now running camps. We used to get contingents from New York, New Jersey, North Carolina, and other states, but they all have their own training camps. Today's most difficult task in my group? Convincing the younger kids when we do multiball that it doesn't matter who goes first, you are all going to get the same number of turns!!! One kid had a meltdown over this, all because he lost a rock-paper-scissors thing with another kid over who got to go first. (Okay, they were about seven years old, the youngest in the camp.) Meanwhile, as we usually do, on day one we focused on the forehand. Here's the article on her ping-pong related charity work. Former USATT President Sheri Pittman Cioroslan is doing an article every day during the last 100 days of Adham Sharara's ITTF presidency. Previous ones are linked from the USATT News page, as well as in my past blogs. Twenty-five down, 75 to go! Here's an article in the Orlando Sentinel about an exhibition at a mall. Taking part were Michael McFarland, Gary Fraiman, Mark Hazell, and Timothy & Aydin Lee. Here's the video (40 sec) where USA's Michael Tran (far side) goes up against Mexico's Dario Arce in the quarterfinals in Austria. Besides the incredible blocking, see Dario's spin move near the end! Dario had beaten Michael in the team competition, and went up 2-0 in games here, but Michael came back to win in five. Here's the video (~15 sec) of the Portugal #1 (and world #13) showing off his soccer skills. Here's video (1:57) of Adam playing outdoor table tennis in a park in China. Here it is - with table tennis! Most top players are at least competent coaches, in that they mostly know the basics. They can show you what you need to do, and even guide you through it. However, the difference between an experienced coach and a top player is often experience. The top player knows how a shot should be done properly; the top coach knows how to get a player to do it properly. Here are five common examples that might be considered "tricks of the trade" for experienced coaches. Assuming Grandiose Ambitions: The first thing a coach should do with a new student is find out what exactly he wants. (The exception is kids, who should mostly be taught the fundamentals.) Older players especially might have established games, and there's no reason to destroy their game just so they can learn to play the game "properly," not unless that's what they want to do. Instead, it's often best to take what they have and build on it. There will be some techniques that you'll want to fix, but there will likely be some unorthodox techniques the player does well, and will probably better off sticking with. If so, that's when the coach needs to be creative and think outside the box - something that comes with coaching experience. Inexperienced coaches are often at a loss what to do when faced with techniques that are outside their experience. A classic example would be a player with the Seemiller grip. Many top players and coaches have no experience with the grip, and yet two players have reached the top 20 in the world using it. It's unlikely a top player with this grip, or just about anyone else who's played this way for many years, is ever going to be better by switching to shakehands or penhold. One top "coach" once forced a 2600+ member of the U.S. National Team who used the Seemiller grip to switch to shakehands during a training camp for the National Team. It didn't go over well. The player, Brian Masters, went on to win the gold medal for Men's Singles at the Pan Am Games. These are just a few examples. Every player is different, and when a coach first sees a player, he has to make an assessment of what bad habits need to be fixed, what good habits need to be developed, find the root cause of any problems, and then reach into his bag of coaching tricks and go to work. Here's a site that's all about table tennis, called . . . All About Table Tennis. A lot of coaching and other information there. Here's the interview with the Voice of Table Tennis and Stand-up Comedian. Here's a table tennis math puzzle from the New York Times. Warning – only for math nerds (like me)! Make sure to check out the comments. One of them ran a simulation and pointed out that in the scenario described, it would take an average of 1.3 million points to win a game! Table Tennis Nation also did a commentary on this. Here it is. I've always wondered why we use such simple rackets, and adjust our grip to the racket, rather than the reverse. 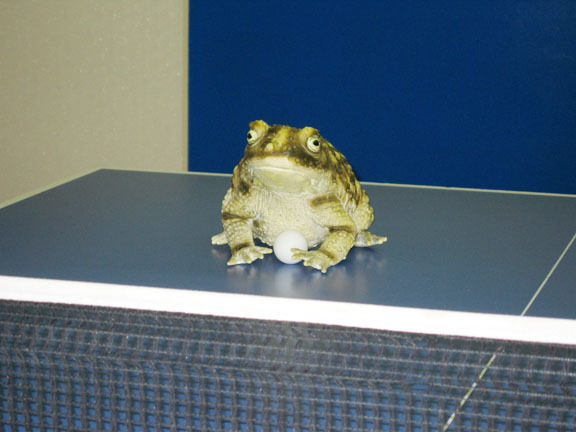 Here's a picture of the star of the TV show "Girls" playing table tennis. Do you like his paddle? Here are seven from the New Hampshire Table Tennis Club. Yesterday was an incredibly busy day (and night). I'm trying to remember how I was able to do my daily blog during our camps the past three summers - there are just so many hours in a day, and just so much energy in the human body. I'm at my limit. But the camp ends Friday. I'll survive. The camp was 10AM-6PM, with a two-hour lunch break from 1-3PM. However, we had a group of 16 kids who came in for a ping-pong party during our lunch break, and I gave a one-hour clinic for them. We started with some ball-bouncing - first on the forehand side, then the backhand, then alternating. It's always interesting to watch as some pick up on this very quickly, while others struggle. It's also an age thing as 6-year-olds simply can't do it, while 8-year-olds usually can. Then I taught them the forehand (taking them two at a time for very quick lessons). I covered the backhand and the serve very briefly, and then we went to games. First came the bottle game, where they had to hit a bottle to make me drink the "worm juice" inside. (Since they were beginners, I brought out froggy and balanced a bottle on him, and to make me drink it all they had to do was hit froggy or the bottle.) Then I brought out the paper cups and they built huge pyramids with them, which they then knocked down as I fed multiball and they smacked forehands. Several of our top juniors are working hard to improve their backhand banana flips. In match play, they tend to either spin them too softly, with the ball dropping short (giving advanced players an easy attack, usually a put-away), or chicken out altogether and mostly push. The problem is that many are still trying to lift short, heavy backspin serves head-on. One of huge advantages of the banana flip is that you don't have to lift the heavy backspin; you instead sidespin the ball, perhaps half sidespin and half topspin. This makes it much easier to lift over the net. In practice the top juniors are getting better at it, but need to develop that confidence that they can do this against any short serve. After the camp was done I did a one-hour private lesson. Then I went to Best Buy to have them look at my laptop computer. For some reason the modem had been failing on and off all day, and the kids weren't happy. (I let them use it for games during breaks. Sometimes they let me use it to check email.) Alas, when I got to Best Buy, the modem worked perfectly, so there was nothing to fix. We'll see how it goes today. Then I was off to Planet Fitness to continue my secret physical training that'll allow me to soon challenge our best juniors again. (Shhh!) I go there Mon, Wed, and Fri, and have been doing this regularly ever since this past Monday. I didn't get home until 9:30 PM. After going through email and browsing forums it was pretty late, so I once again put off the 246 things on my todo list, including 42 that have earth-shattering consequences if I don't get them done immediately. 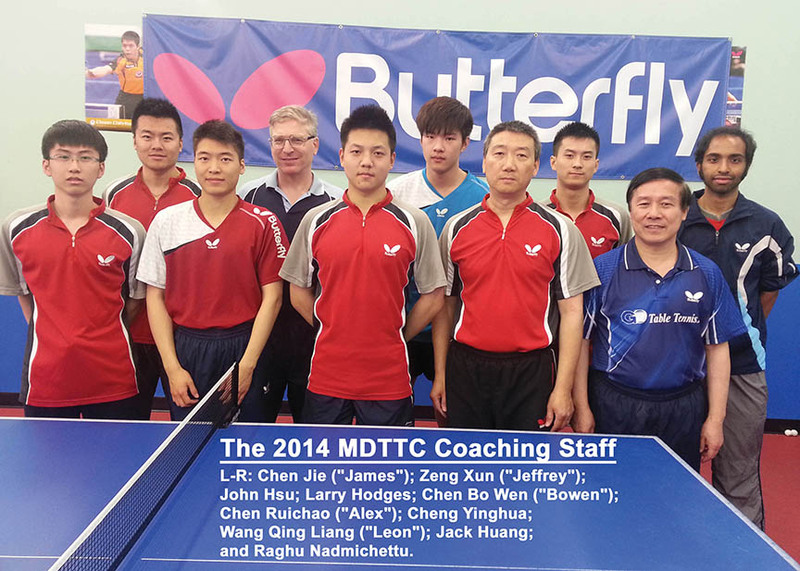 Here's a group picture of the entire MDTTC coaching staff, all ten of us, taken by Wen Hsu yesterday during our Spring Break Camp. L-R: Chen Jie ("James"); Zeng Xun ("Jeffrey"); John Hsu; Larry Hodges; Chen Bo Wen ("Bowen"); Chen Ruichao ("Alex"); Cheng Yinghua; Wang Qing Liang ("Leon"); Jack Huang; and Raghu Nadmichettu. Here's an email I just received. Charlie was one of the huge names in table tennis when I was coming up in the late 1970s. He will be missed. I am deeply saddened to report that Charlie Disney passed away at his home in Rio Verde , AZ yesterday. I was called this evening by a friend in Rio Verde. I have never met that acquaintance. Charlie was one of my dearest friends in my life. We knew each other for 52 years. We were tirelessly business partners in the Magoo’s (later Disney’s) Table Tennis Centers for 21 of the 26 years I was involved and we were real estate partners for 6 years with several properties. Charlie and I remained the closest of friends for five-plus decades without a gap. We discussed endlessly and regularly about how to get table tennis recognized as a major sport, and never gave up on that issue. I am in deep sorrow. More information will follow but I have no other as of now. I had just talked with Charlie on Monday and purchased a plane ticket for him to return for the summer to his home in Roseville, on May 6. Charlie had returned recently from a trip to FL to visit the entire Soderberg family. I will never see him again. He grew up in Edina, MN but he has no family alive except one distant sister, so I have no information as of yet regarding funerals or memorials. Here's the info page. I'm hoping to go to this, but am not sure I can afford it. It would mean missing two consecutive weekends of coaching plus the five days in between - that's a lot of hours missed. Here's the info page. Sign up now to have these daily updates sent directly to you. 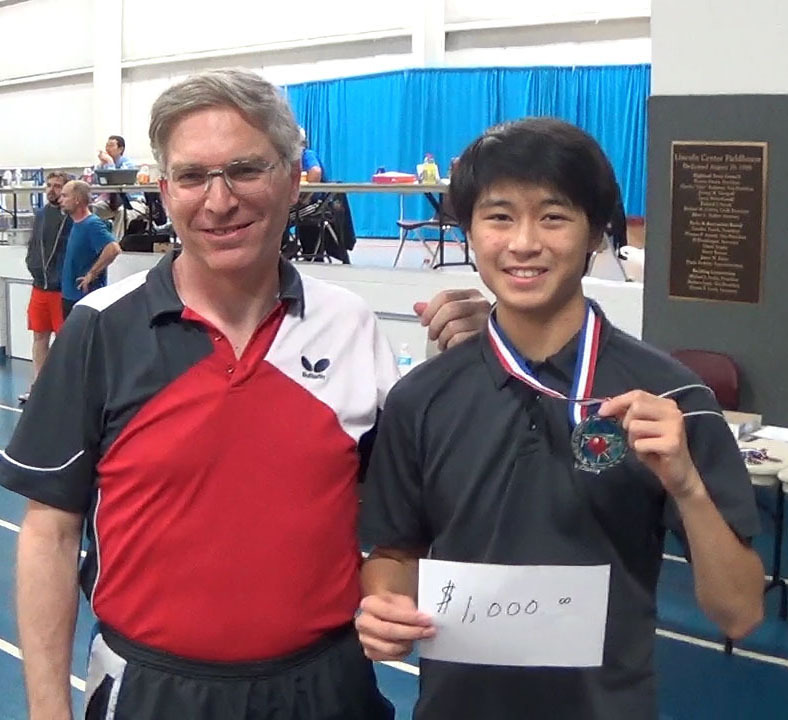 As I blogged about yesterday, Adam won the ITTF Voice of Table Tennis Contest. Here's the ITTF article. Here's the article. Here's the main excerpt: "Germany, with Timo Boll and Dimitrij Ovtcharov, is considered a big threat for the Chinese Team. According to Liu Guoliang, Germany, Japan and South Korea are their main opponents. However, he has placed emphasis on Japan who will be the hosting team in the 2014 World Championships. In order to cope with the challenges from the Japanese Team, China has prepared several players who can imitate the Japanese players and had them fight against their delegates in the Closed Training. This is to help their players adapt to the hosts." Here's the video (33 sec, including slow-motion replay). If you are distracted by the player on the left making that body-spinning forehand rip at the end you may miss that the player on the right made the counter-smash. Here's video (6:53) of the English power table tennis couple of Joanna and Paul Drinkhall on BT Sport. Here's the Facebook posting and picture of this 13-year-old Namibian player. Here's a hilarious video (3:52) by Parkour that I can't begin to describe. It's part of the Pepsi Max Challenges. Yesterday was day two of our Spring Break Camp. The highlight was Channel 5 News coming in to do a feature on Crystal Wang and the MDTTC. They filmed lots of Crystal and other players, and did interviews with Crystal, Coach Jack Huang, and me. I think the feature of my interview was when he asked about Crystal's goals for making the Olympics. I explained how making the 2016 Olympic Team was first priority, but that she'd be only 18 for the 2020 Olympics - and that was where the goal would be to medal, perhaps gold medal. Then I pointed out that we'll know she's made it when the Chinese coaches start studying her on video, and develop a practice partner who mimics her game so they can practice against her! Yes, that's what the Chinese do, and you haven't really made it in table tennis until you have a Chinese doppelganger who studies you on video and copies for other players to train against. After some time reviewing the forehand, spent a lot of time yesterday on the backhand. The beginning players mostly seemed to pick this up quicker than the forehand - perhaps they're getting used to learning new TT stuff. However, several are having trouble with their serves. That's going to be a focus today. I'm also going to introduce pushing. However, none can challenge the true champion - me! When I was also about ten I had this game, and I also became obsessed with it. I practiced it day after day, and kept careful track of my results. This went on for weeks. I finally stopped when it became just too easy - I had several stretches where I'd get Pluto hundreds of times in a row. I finally put it aside and didn't play for about 44 years - then I picked up a set a few weeks ago, and discovered I could still do it. I mostly let the kids use it non-stop, but now and then I stop by and get Pluto a bunch of times in a row, which only makes them more determined. Adam Bobrow - the Voice of Table Tennis! Here is the High Performance Report for March, 2014, by Chair Carl Danner. You can read previous ones and reports from other USATT Committees at the USATT Reports page. Coach Ben Larcombe from England has been on a one-year project to see if he can turn a beginning adult player (Sam Priestley, age 24) into an "expert" in one year. He even has a web page where he explains and chronicles the adventure, and where you can sign up for regular updates. Here's an article on the project. Here's the story, and here's the ITTF video interview with him (1:40). Here's the ITTF video interview (3:40) with USA coach Lily Yip during the recent Canadian Junior Open. Here's the video (46 sec, including slow-motion replay). Here's the video (3:43) of junior star Tina Lin, which introduces her at age nine and other ages. Here's the picture. "Not everyone can say they've gone to the prom with an Olympian! Thanks for a great night!" Lily was on the 2012 Olympic Team and was the 2012 USA Women's Singles Champion. Here's the video (23 min). I haven't had a chance to watch it yet - too busy with spring break camp and other coaching - but if someone wants to do a short review, please comment below. I did browse through it and there's lots of table tennis action, all animated, apparently in a training environment. 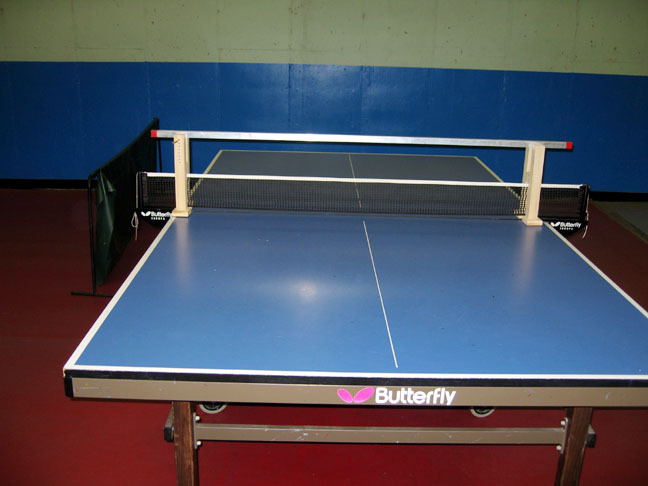 Have you noticed that there are a number of people in table tennis who have their own "niches"? I'm a prime example; while there are plenty of other table tennis coaches around, none write anywhere near as much as I do, so my table tennis niche is writing. (Six books and over 1300 published articles on table tennis, plus this blog.) Who are the others? (This doesn't imply that this is all they do in table tennis; it's what they do that stands out, that few others do.) Anyone and any niches that I missed? Mike Mezyan's table tennis niche is artwork. Brian Pace's table tennis niche is videos. Jim Butler has recently been joining him in this niche. So has Gerry Chua and a number of others. There are a number who have found their niche as table tennis photographers. They include Mal Anderson, Gerry Chua, Diego Schaaf, Bruce Liu, Tom Nguyen, and the others I accidentally left off who will be angrily emailing me shortly. Then there's Ayoade Ademakinwa, with tabletennisphotos.com. Richard Lee's niche is running nationwide tournaments. Plenty of others run tournaments, but few others run big ones all over the country. Craig Krum also runs a lot of tournaments around the country with his Omnipong software. Scott Preiss, Adam Bobrow and Judah Friedlander are the table tennis entertainers. There are other niches as well, but most have larger numbers - I'd call them groups instead. To how many of the following 50 table tennis groups do you belong? I finally put together a simple page where I can list and sell all of my books: larryhodgesbooks.com. It actually takes you to a page I created here at TableTennisCoaching.com. I'm not sure why I didn't do this long ago - I bought the larryhodgesbooks.com domain name a while back. Here's the article. No, it's not a rematch of their famous quarterfinal match at the 2003 Worlds! "…you make it that much easier for me to beat you." Here's a nice table tennis meme. The title above is only the ending of the meme's statement. Here's the video (38 sec). Here's video (1:07:29) of the final of the German Open this past weekend, won by Dimitrij Ovtcharov over Jun Mizutani, 11-9 in the fifth. Jump to 1:04:20 to see the start of the last point of the match - a great one! Or watch the entire thing. Here's the page from Uberpong. I think I posted this once before, but I was browsing it yesterday and thought I'd put it up again. I don't think the first one was there before, the one with the brick wall and barbed wire! It'll take a lot of topspin to pull the ball down over that - or would you tactically play through the barbed wire? I don't think I covered this in my tactics book. Some serious, some not so serious. You judge which. No-Hidden Serve Rule Adjustment. When serving, players should be required to serve so that the ball is visible to both umpires, or where the umpires would sit if there were umpires. When there are no umpires, it would be assumed the umpires would be sitting five feet out on each side, lined up with the net. The point of the rule isn't to make sure the umpires can see the ball. The point is that if a server hides the ball from an opponent but it isn't obvious he is doing so, it'll be obvious he's hiding it from at least one of the umpires. No more hidden serve problems. Execution of Servers Who Hide Contact. For now on, on the first instance of a player hiding his serve, his opponent shall have the opportunity to slap him in the face. On the second instance, the player shall have splinters shoved under his fingernails. On the third instance, the player shall be dragged outside and executed by firing squad. 38mm Ball, 21-point Games. I confess, I miss the way it was played the first 25 years I played. I especially miss 21-point games. I'm not a hardliner on this, but I am nostalgic. Additional One-Minute Timeout. Right now players get a single one-minute timeout where they usually consult with a coach. But that's not fair to coaching authors. Why not a second one-minute timeout where players can consult with a table tennis tactics book? 50% Rule. All members of USATT shall donate 50% of their salaries to USATT, where it will either be used to develop the sport in this country or it will be squandered in some highly unimaginative way. The Late No-Learn Rule. When a player shows up late for a class, the coach shall mark down what the player missed and pass this on to all other coaches in the world, with the understanding that no coach shall ever teach that player what he missed for coming in late, and that player will always have a hole in his game because of this. Additionally, all future opponents of this player shall be informed of the hole in this player's game before they play so they may play into it. Additionally, the late player shall get ten lashes. Scream Rule. Players may only scream at the top of their lungs ten times in a match. On the eleventh such scream they shall be defaulted, their rackets broken, and their tongues pulled out. Here's the article - and no, he's not insulting him, he's talking about what it was like playing him. Here's the article, which includes a nice cats-playing-TT picture. Here's a video (29 sec) showing one of the zillions of possible drills with a robot. 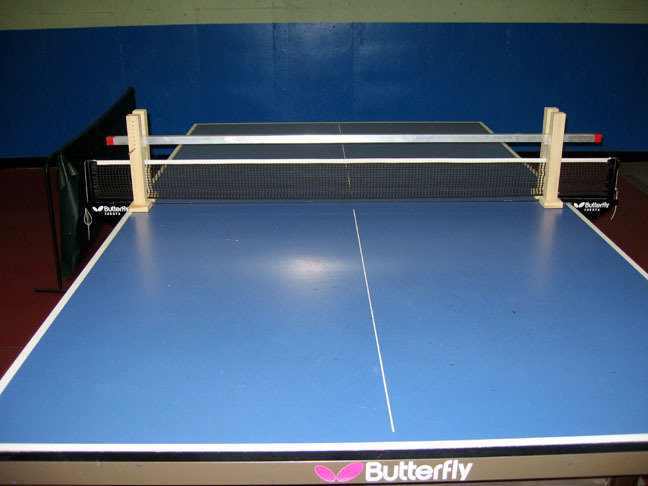 Most of the major table tennis dealers now sell these advanced robots, but they are more expensive than the less expensive ones, which primarily hit either to one spot or randomly all over the table. Here's a video (75 sec) that features the players from the SF bay area that are trying out for team at the Trials at Texas Wesleyan University, Fri-Sun, March 7-9. Here's a video (54 sec) of Adam Bobrow hitting with kids at a school. At 34 sec in he can't resist throwing in a high, sidespinning-backspinning lob. Playing Table Tennis on Drugs! Here's USATT Board Chair Mike Babuin's new blog on "Changes for 2014." It's mostly good stuff. Many of the items he writes about we can't really judge until we know more about the programs, and see if they will actually be implemented. USATT historically doesn't have a high batting average in that regard. Here are my short comments on each. On Change. Mike quotes Einstein: "Madness is best described as doing the same things over and over again while expecting different results." He also talks about how some are resistant to change. I've been arguing the same type of thing for decades as I've watched one administration after another do the same type of stuff while expecting different results. However, not all change is good. Change for the sake of change isn't going to help things; there has to be a specific reason for each change. Some changes are obvious; others are experimental as you don't always know if something will work until you try it. Often leaders are afraid of the latter type because they'll get blamed if their program doesn't work. Solution - try a number of programs, and if you think them through and plan them out, some will work. The alternative is to do nothing, which is most of USATT's history. On the Polyethylene Ball: He says USATT is still evaluating the change. Personally, I'm ambivalent about it. I'd prefer celluloid, but the new poly ball I tried at the Nationals (see second item in this blog entry) is pretty similar. But even the subtle differences will take time to get used to. Some say that the new ball gets less spin, but it's not clear if they were using the same ball I tried, or another type, since they're not all the same. Also, as I noted in the blog entry, when I tried out the ball I was having serious arm problems and couldn't loop very hard, and partially relied on others to tell me how the ball played. On RailStation Roll-out: We'll have to wait and see on this one. USATT has periodically gotten infatuated with various softwares, such as one I think used by the Brazilian TTA that we talked about adopting for years but never did so. I have no idea if this will useful. On Creation of a Recreational Division and Website: I'm all for both. However, it's not clear what the program constitutes. If it's just informational, then it's somewhat helpful but not much. What's needed is something that a new player can immediately get into on a regular basis - i.e., a league. I've blogged about this so many times it's repetitive, but it's one of those obvious things that many don't get. When a new player comes into a club, you can't toss him in with the experienced players and expect him to have a positive experience as he's getting killed. You need leagues for all levels, as well as available coaching (classes or private coaching). Without that, we're just waving our hands. Recreational players are recreational players until we give them a reason to become serious players and join USATT. I once joined the U.S. Tennis Association for one reason only, as did the vast majority of their 700,000 members - to play in their tennis leagues. On the Digital Magazine: I've blogged about this several times, such as here and here. I'm all for it. Some still don't get it that you can be for the online magazine, as I am, while still against canceling the print one. I'm also a bit peeved that members who paid expecting the magazine, and especially life members, will have to pay a fee to get a printed version. As to the magazine eventually being members-only again (the online version), that might be a good idea as it at least returns some added value to memberships. On Tournament Sanction Process Roll-Out: I haven't studied the new sanctioning procedures - they changed right at the time I stopped running tournaments at MDTTC (Charlene Liu took over). However, it is a good idea to go to the quality of the tournament, not just the prize money. However, I'm a little reticent about their removing any regional protection for tournaments. That's one of the primary reasons to sanction a tournament. It means higher risk for tournament directors and clubs. Some clubs rely on revenue from tournaments to finance their club; if someone suddenly decides to run a competing tournament locally on the same date, they have a serious problem. On the $5-million Quad Roll-out: We'll need a lot more info on this to figure out what it is. Announcing a plan to raise $5 million is about five million times easier than actually raising $5 million. It's been a long time since USATT has raised any serious money, as they used to do in the 1980s with a series of large sponsors. There are two coming up, a Level 1 Course in Akron, OH (July 28-Aug. 1) and a Level 2 Course in Austin, TX (Aug. 25-30). For more info, see the USATT Coaching Courses Page. Here are the rules for qualifying. This is part of the ITTF's Women's Development Program, where they encourage you to "… find a way to celebrate women and girls in Table Tennis." Here's an article with a link to a video trailer (4:49) where retiring Chinese team members give messages to their teammates (in Chinese, alas). Here's a video (4:03) where a player demonstrates his tricky spinny serves. I think the commentary is in Chinese. Note that the serve where the ball bounces back into the net is more for show, and is easy to return; in a real match, it's better to serve the ball so second bounce is near the end-line. Hidden talent: I thought I was good at ping-pong until I saw some of these other guys playing in here. [Laughs]. I don't have anything else cool, I'm boring. Here's the video (20:49). Here's more about Actor, Comedian, and Table Tennis Player Adam Bobrow.